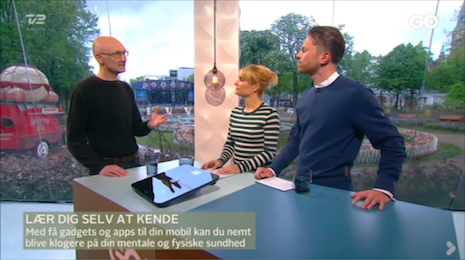 I appeared on the TV2 “Go’ aften Danmark” show tonight (May 12) to discuss the phenomenon quantified self (in Danish: selvmåling) and also the potential for our future health care system. The hosts were really good sports, as they had themselves been self-tracking steps, weight, body fat, activity, and mood for about a week. The show is available on the TV2 Play website (subscription required) starting out with a general discussion of quantified self and self-tracking and in the end of the show we discuss the future potential of self-tracking. This entry was posted in blog and tagged press, quantified self by Jakob Eg Larsen. Bookmark the permalink.